Summer is here and that means it’s time for some fun family weekend getaways! We’re heading north in a few weeks and I can’t wait to use our new Washington DC photo scavenger hunt printable with the boys to get some great photos together. Growing up, my family always made a big deal out of vacations whether we traveled near or far, on a long trip or one of many family weekend getaways. I remember getting as excited to spend a couple days at a friends house on the beach as I did taking road trips to places far off. There’s just something about hitting the open road (or sky) and seeing where it takes you. Now that I’m a mom, I hope that I can instill the same love of exploration in my kids. My husband and I both love trying new things and our list of destinations keeps getting longer with each place we visit! The boys both get out of school at the end of May, which is earlier than most of the other schools around here. We thought it would be a great chance to take a few days in Washington DC for some sightseeing and good food. 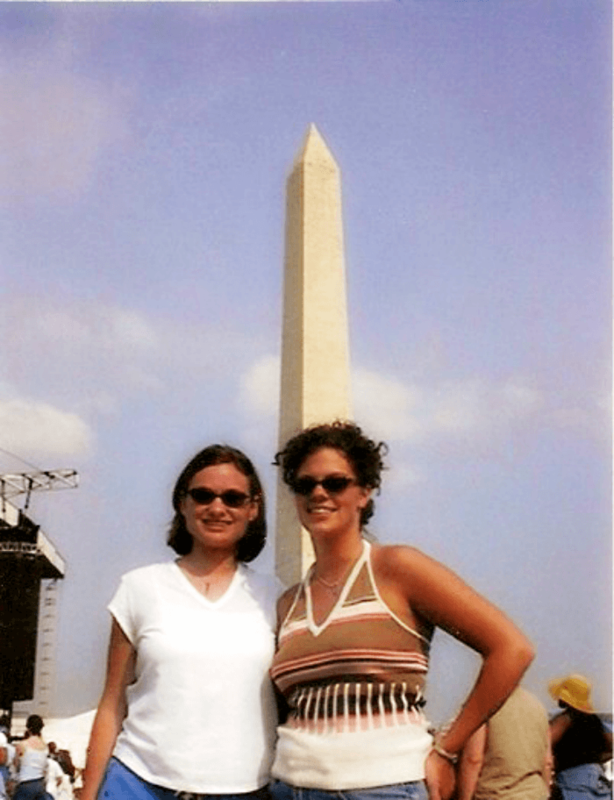 I’ve been to Washington DC twice in my life, but both of those visits were long before the days digital photo sharing. I had to dig around to find this pic and I’m hoping to find some from a childhood trip to share soon. I’m the only one in our family who has ever been to our nation’s capital so I am really excited to experience as much as we can together. One way I plan to get the kids excited is to let them loose with one of our old phones so they can snap their own pictures. I think it will be a fun way for them to remember this family vacation and I can’t wait to see the trip through their eyes. 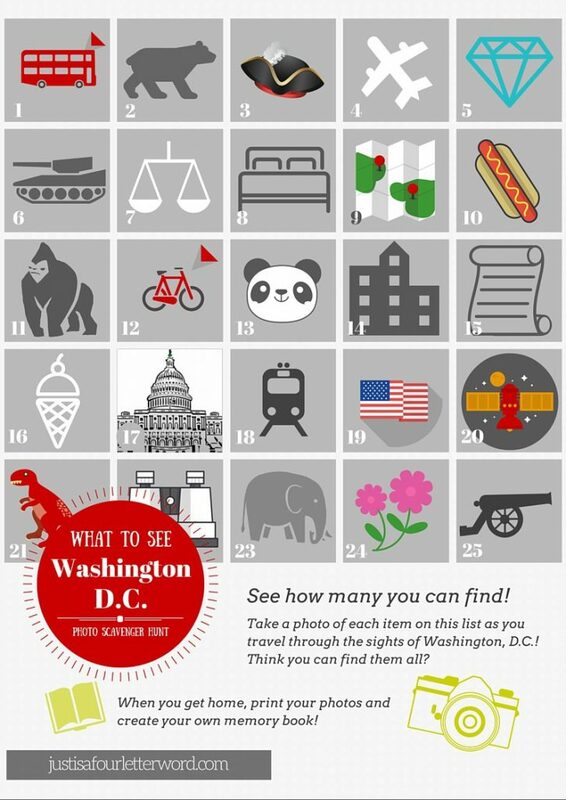 I created a Washington DC Scavenger Hunt Printable to bring with us that the boys can use it to get ideas for photos and see how many they can cross off! I’m offering this printable to you for FREE! Whether you are ready or not, summer is here and it’s time to have some fun! For many of us, a long summer vacation isn’t really on the agenda so we have to make the most of our weekends. If you’re in or near the mid-Atlantic, a family weekend getaway to Washington DC is a great way to keep kids excited about learning and have a great time. To print, just click the image below and a 2-page PDF will open. The first page consists of image hints for photo-op ideas. On the second page, match up the number on the list with the image to learn where and how to find the photo-op! Note: These are not meant to be done in order so don’t worry about that part. Pick and choose the ones you want to find and have fun! Stay tuned for more about our weekend family getaway to Washington DC. We have some fun plans and I can’t wait to have a great time exploring with my three favorite boys! Do you have any summer vacation plans? Tell me in the comments below! And if you like this printable, please share it with your friends! I LOVE this printable! I take a lot of DC for granted since I grew up here but my son still hasn’t seen so much. Will be printing this out for our DC weekend in June!